Are you determined to learn blackwork? Then you have finally reached the right place to start your journey to success, as Blackwork embroidery is my specialty, and I'd love to show you how its done! 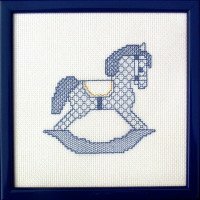 Try my simple, colour-by-numbers formula for learning this exciting needlework technique. New easy methods make certain your embroidery looks as good on the back as it does on the front. Sounds too good to be true? I'm going to show you how easy it is! So what are you waiting for? Remember a stitch in time saves nine! Want more easy designs? Why not grab a copy of my blackwork for beginners ebook. You can use the buttons beside the designs to order the pattern and download it directly to your computer. Or you can visit my other site www.x-calibredesigns.co.uk to order the complete kits. 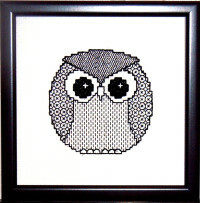 Three blackwork fill patterns and cross stitch for his eyes bring this little blackwork owl to life. Perfect for a card or gift for a new baby. Stitch him in blue or pink threads. 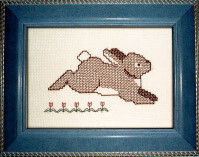 This sweet blackwork rabbit with a simple border makes a lovely picture for a child's room.